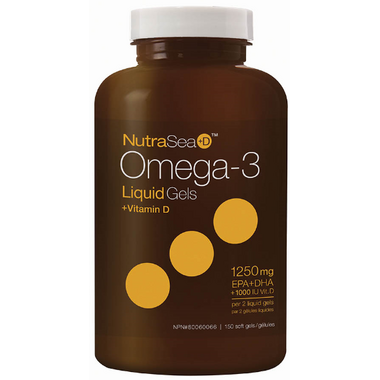 NutraSea+D is available in a liquid and convenient 2x concentrated softgel option. Great product. Recommended by my dietician. Glad I tried. Best one so far. Like the combination of Vit D and omega 3. No fishy taste or odour. A very good product with no fishy taste. Excellent product ... no fish smell or taste. Great product, no fishy taste at all, with noticeable health results ! Easy to take, and very fresh - no after taste! Easy to swallow and no after taste. Excellent product. No fishy taste. Arrived fast. Good condition. I am so pleased with this! It has helped to clear my skin and made my periods so much less painful!! I'm not able to prep/cook fish for my family due to anaphylaxis so these are a fantastic option for my boys. Excellent and easy to take. No bad taste. Really awesome product. Easier to take than the straight liquid format personally. I find these capsules very easy to take and I like having the D added--one less pill to remember. I don't suffer any burp feedback as I have with other brands. Capsul form is great, as is the mint flavour, which you don't know is there until you (may occasionally) burp it. It is better than a disgusting fish-fat burp by far - because, ew - and I think it may even help soothe my iffy pregnant stomach. I'll stick with these post-natal too, and I encourage my husband to take them. Great alternative to fish or krill oils which I find for me tend to repeat and are not very pleasant to take. Bonus getting the vitamin D included !! Very good product, high in EPA and DHA. Easy to take. The liquid form is good as well. Pleasant taste.